With finely tuned engineering on the inside and a shiny, fluid design on the outside, the Acid Multi-Light Pendants by Modern Forms prove that form and function go hand in hand. A simple aesthetic, a dedication to energy efficiency and a forward-looking approach have elevated Modern Forms to the top of the LED heap. An offshoot of WAC Lighting, Modern Forms designs exclusively LED lighting for indoors and out, with an eye on elegance and versatility. We got down and dirty with the clean, green studio to find out more about their new Acid Collection and what’s on the horizon for this dynamic brand. Tell us about the Acid LED collection. The Acid Collection represents fluidity in solid shape. The glamorous metallic curves on the outside mask—but don’t hide—the years of research that have gone into every individual component on the inside. It’s not just a thing of beauty, but a finely tuned light, meticulously crafted from the component level, to provide the exactly right kind of illumination and emotional resonance. At the time of the design, glass pendants were everywhere and it was hard to see a way to make another series of glass pendants stand out with originality from the sea of overdone glass mini pendants. There was an opportunity to play around with metal forms; we knew we could seamlessly incorporate technology into the design and provide real functional illumination as opposed to solely decorative elements that self-illuminate. 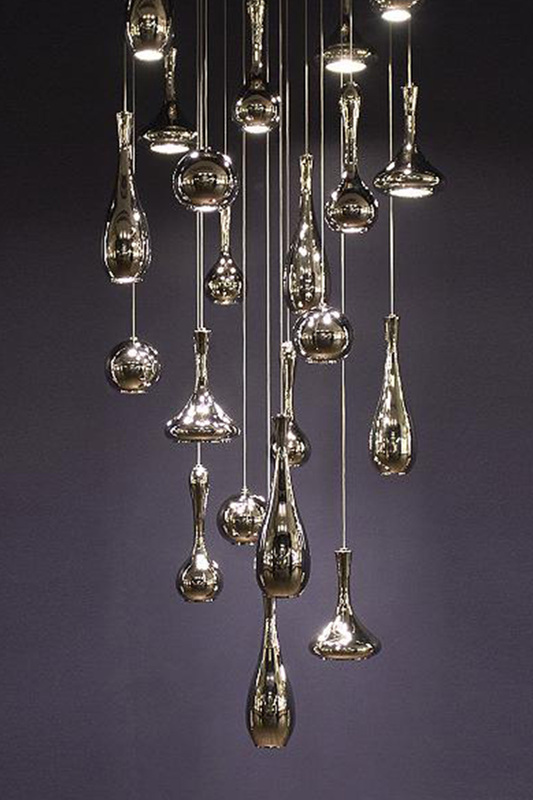 So I imagined a dripping assortment of polished metal pendants in forms that resemble liquid suspension of two densities. With the high shine and irregular curves, the Acid Collection sparkles like beads of mercury that may be customized in groupings up to 21-light pendant clusters. How does the Modern Forms design process work? For us, there is no real formula. Our creative process is an organic one that evolves through a continuous exchange of concepts between our product designers and our electrical engineers. The Modern Forms’ design process is then refined at the component level, where our original technology is combined with our love affair with beautiful, modern materials culminating in innovative designs that demonstrate the care and attention to detail we have built our brand around. Lighting technology is changing quickly, and Modern Forms has always been on the forefront. How do you stay ahead and maintain the utmost quality that Modern Forms is known for? We stay at the front of new design trends, because our dedication to the craft goes far deeper than just a paycheck: We have an insatiable curiosity around what is new and love the chance to create. Surrounded by a community of likeminded innovators, we maintain relationships with innovators in parallel industries and participate in funding blue sky, new tech research. As a multi-generational family-owned company, we’re dedicated to embodying all that is possible when connecting high tech and high fashion. 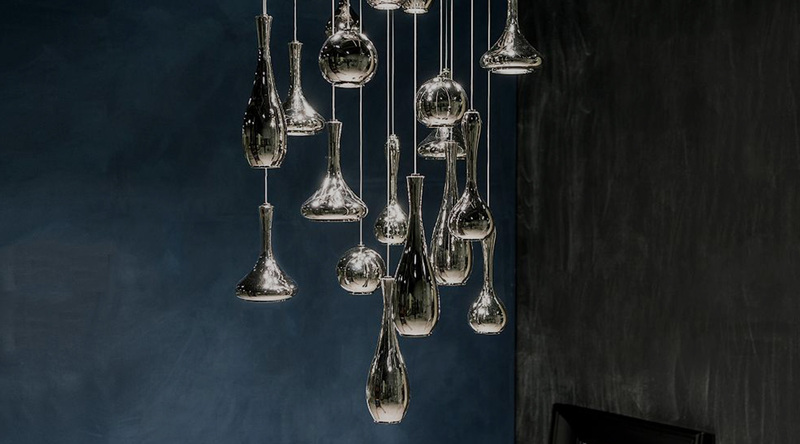 The customizable Acid LED Multi-Light Large Pendants feature metallic droplets that reflect the surrounding environment. 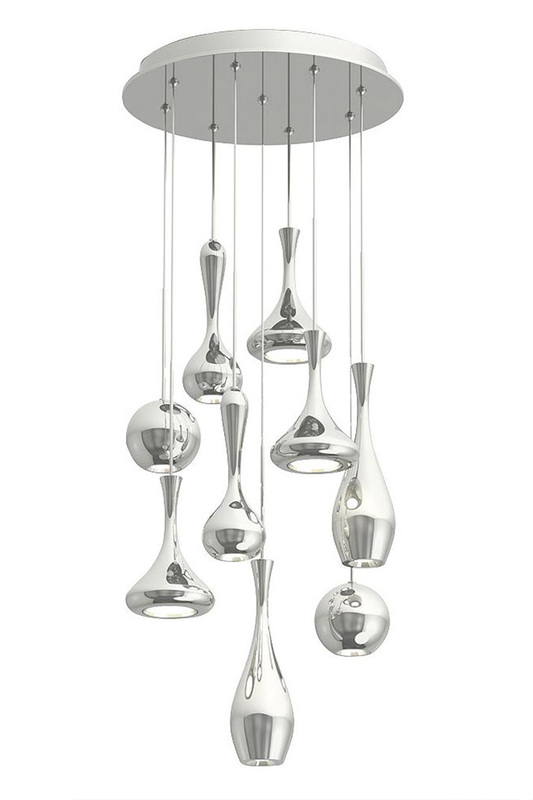 Is the multi-light pendant a trend that you see continuing? In a break from the past, we have noticed a segment of modern design take hold that suggests that “more is more.” Bigger is better, because our customers are craving not just more light, but grander light in statement pieces set in contrast to the understated functional light incorporated into the architecture. Multi-light displays achieve that statement in customizable sizes to scale for different spaces, ranging from an urban loft to a grand foyer. What is next for Modern Forms? Modern Forms continues to drive forward rapid advances in technological innovation, while honing years of artistry and design experience, all to produce advanced and beautiful lighting for a brighter future.